On last month of December Chennai has affected by the flood. This flood has been declared as the National Disaster. People living in Chennai and their livelihood has affected by the flood. The Vyasarpadi is also one of the most affected by floods in Chennai. People have faced many problems and lose due to the flood. People in Vyasarpadi don’t have basic need such as foods, water during floods and couldn’t go out of the home. Hut people lost their hut and their shifted into the schools, family members are separated one and other. People were affected by psychologically, still there are not come out from stress, fears, anxiety etc. They don’t have electricity and network to communicate. They lost their Cloths, vessels, Certificates, living things and so many things due to floods. Most of the people in Vysarpadi are doing unskilled daily workers. They couldn’t go out for work and doesn’t have work during floods. So they faced economic problem. People also faced health problems such fever, cold, skin problem, ringworm, eczema etc. Due to flood the government has been declared holiday for schools and college, so the syllabus is uncovered. Some of children lost books, uniforms in floods. Drainage waters mixed with rain water and it has come in to home, it effected the home appliance. Flood has been affected their daily life of people. 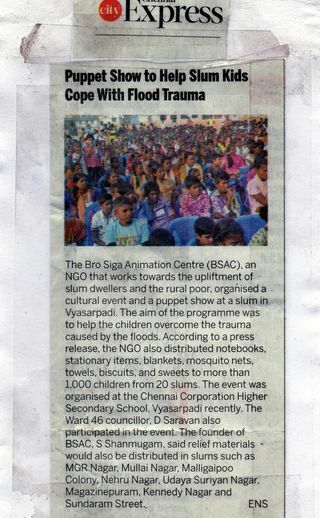 So BSAC has planned to support for people in Vyasarpadi. Because of heavy rain and floods so BSAC has started to provided basic needs such as foods, water, cloths. We requested and proposed with many organizations, corporate sectors, service sectors to collect resource and bridge the gap between resource and victims. BSAC covered nearly 18,000 families out of 36,000 families in Vyasarpadi. Almost 50% families in Vyasarpadi got benefit from us.